I drag myself up off the shores of this depression. I sit up and spit the sand and salty water of regret and worry from my mouth knowing I need to find fresh water for my soul. I manage to pick myself up, shower myself off, and start some laundry. I make my way to my office and begin reading where I left off in my study hoping to be inspired to encourage, but all I find is that I am exhausted from the waves that have hit hard and knocked the breath of encouragement from my lungs. Instead, I find it is I who need the encouragers to speak into my world. Sometimes that is okay. Just because encouragement is a calling doesn’t mean it is perfection. So I am writing to tell you that we don’t have to be perfect at what we do. Sometimes we just have to be brave enough to say we need encouragement too. And that is more than okay. That is courageous. Although we are not perfect and cannot be until the day we are made perfect in Christ Jesus, we can bring our weaknesses to God bravely and know that His strength is made perfect in them. So by surrendering to our weakness and admitting them we are actually made perfectly strong through the power of the LORD. That encourages me friend, which is fresh water for my soul. How about yours? The link up I am joining from week to week that encourages my soul is the flood gate I choose to open and share with you Beloved. Just click on the link below for more encouraging fresh water for your soul. I had an interesting beginning to my Mother’s Day weekend last weekend. I was actually in the hospital overnight on Friday night. It was for a Sleep Study. I had to pass the Pediatric Intensive Care Unit coming in and going out of the Sleep Center located on the seventh floor of the hospital. I remembered my little one now thirteen and how I had rocked her with a tired soul endlessly and sang over and over Amazing Grace a capella to the tune of The House of the Rising Sun when she was one year old. She had a seizure disorder God miraculously healed, and I loved telling the story, but what I thought about this time is that I really didn’t want to leave the hospital. What I really needed was Intensive Soul Care. With all the bells and whistles. Put all the monitors on me, go ahead and start an IV and let me just rest. Because I really need intensive soul rest. Yes, I was sick. Yes, I had Bronchitis, but more than that I was soul weary. Bruised and battered by life and I had no idea how to crawl out of the depression I was in. Somehow I think the lack of good sleep is a major contributing factor too. I’ve been part of a book club study on my blogosphere friend Bonnie Gray’s book, Finding Spiritual Whitespace, and she asked us to blog about what we whitespace special brew we felt we needed. 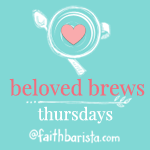 How about you take a look at Bonnie’s blog about Soul rest and leave a comment about what special brew you would benefit from. Oh, how we each need encouragement along this journey of life. You spoke real into this as encouragers need encouraging just as caregivers need care (as I have written about this week). May the LORD rain down His blessings upon you and may He reign in your heart.